Chubasco Fishing Charters is a Bahamas registered, owned and operated company, specializing in sportfishing in Nassau and Paradise Island, be it big-game deep-sea fishing or light tackle reef-fishing. Located in Nassau, at Harbour View Marina on East Bay Street, 10 minutes from Atlantis, Sun International’s Resort and Casino. Chubasco Fishing Charters fleet consist of four charter sportfishing yachts, all fully equipped for Sportsfishing, Snorkeling, Sightseeing and Island Picnics. Whether you’re a first time angler, or an experienced sport fishing enthusiast our goal is to provide a Nassau charter fishing experience that exceeds your expectations. When deep-sea fishing or reef-fishing off Nassau on board one of the Chubasco fishing yachts with Capt. Mike his son Capt. Adam or one of his professional captains and mates, you’ll enjoy a wealth of fishing experience, courteous service and an ocean full of fun awaiting you and your party. The Bahamas is well known as one of the great Sportfishing destinations of the world. We have calm water most of the year and very little travel time to get to the fishing grounds. Less than a quarter mile off Nassau and Atlantis’s Paradise Island you are deep-sea fishing. On the north side of Nassau and Paradise Island, you are in 1,000 feet of water 15 minutes from the dock and 4 miles off you are fishing in 6,000 feet of water. You’ll discover that sport fishing off Nassau is unlike any other big-game fishing experience you’ve ever had. 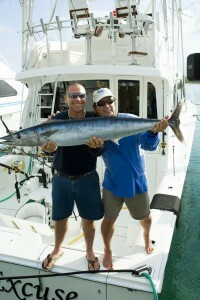 Sportsfishing in Nassau is truly an event where the whole family can enjoy a day on the water. Although Blue Marlin, White Marlin, Sailfish, Yellowfin & Blackfin Tuna, Mahi-Mahi (Dolphin) and Wahoo, are the usual prey, we can customize your charter depending on your fantasy. Remember Marlin may not be an everyday catch, good fighting fish are. Let us show you fishing can be fun, bring the entire family and share the excitement. Whether deep-sea fishing, reef-fishing, snorkeling, island picnicking or a combination of all four, our mission is to make your Nassau yacht charter a special occasion you and your party will always remember. is one of our latest additions, it is an air-conditioned 38′ Hatteras Express. With a Marlin Tower, large fishing cockpit and a comfortable air-conditioned interior, Chubasco VI can comfortably accommodate up to 6 persons for fishing, sightseeing and snorkeling. It is $675.00 for a half-day charter (4 hours) and $1350.00 for a full day charter (8 hours). Prices quoted are our discounted direct booking prices. Quoted prices are not valid when booked through tour representatives, hotel guest services or concierges. All prices quoted are for the boat for a private charter exclusively for your party and not per person. Prices are based on a maximum of 6 persons. Our half-day charters are 8 a.m. to 12 noon and 1 p.m. to 5 p.m.; on full day charters our departure times are flexible. We also offer a 5 hour morning charter starting at 7:30 a.m. to 12:30 p.m. and a 5 or 6 hour afternoon charter starting at 1 p.m. The cost includes captain, mate, bottled water, ice and all fishing and snorkeling equipment. Food, soft drinks and beer are not included, but with advance notice can be put on board at an additional charge. Our fishing equipment is all new top quality custom made Leeward Rods and two speed Avet Reels consisting of the following, two 12lb., two 20lb., two 30 lb. and two 50 lb. trolling rods and reels, various Leeward Spinning Rods and Penn 750SS Spinning Reels. Electronics consist of a Simrad Radar, Raymarine and Simrad color Depth & Fish Finders, VHF Radios, Garmin GPS and for your listening pleasure a XM Satellite Radio. Due to the problem of last minute cancellations or no-shows that results in us having to cancel a charter, inconveniencing other guest booked on that charter, we do not put together groups for a shared charter. All prices quoted are for private charters. All Prices quoted are based on a settlement in U.S. Dollars. is one of our latest additions, it is a 36′ Tiara. With a Marlin Tower and large fishing cockpit, Chubasco V can comfortably accommodate up to 5 persons for fishing and up to 6 persons for sightseeing and snorkeling. It is $625.00 for a half-day charter (4 hours) and $1250.00 for a full day charter (8 hours). Prices quoted are our discounted direct booking prices. All prices quoted are for the boat for a private charter exclusively for your party and not per person. Prices are based on a maximum of 5 persons, there is a $50 per person charge for over 5 persons and up to 6 persons. Our half-day charters are 8 a.m. to 12 noon and 1 p.m. to 5 p.m.; on full day charters our departure times are flexible. We also offer a 5 hour morning charter starting at 7:30 a.m. to 12:30 p.m. and a 5 or 6 hour afternoon charter starting at 1 p.m. The cost includes captain, mate, bottled water, ice and all fishing and snorkeling equipment. Food, soft drinks and beer are not included, but with advance notice can be put on board at an additional charge. Our fishing equipment is all new top quality custom made Leeward Rods and two speed Avet Reels and consist of the following, two 12lb., two 20lb., two 30 lb. and two 50 lb. trolling rods and reels, various Leeward Spinning Rods and Penn 750SS Spinning Reels. Electronics consist of Raymarine Depth & Fish Finders, VHF Radio, Garmin GPS and for your listening pleasure a XM Satellite Radio. Charter prices do not include gratuities for the captain and mate. The customary tip for the crew is 15% of the charter cost. Of course more gracious tips are highly appreciated and are usually awarded for exemplary performance. our luxurious air-conditioned 48′ Hatteras, is $875.00 for a half-day charter (4 hours) and $1750.00 for a full day charter (8 hours). All prices quoted are for the boat for a private charter exclusively for your party and not per person. With a flybridge, tuna-tower, large fishing cockpit and a comfortable air-conditioned interior, Chubasco III can accommodate up to 8 persons for fishing and up to 12 persons for sightseeing and snorkeling. Prices are based on 8 persons, there is a $50.00 per person charge for over 8 persons and up to 12 persons. Our half-day charters are 8 a.m. to 12 noon and 1 p.m. to 5 p.m.; on full day charters our departure times are flexible. We also offer a 5 hour morning charter starting at 7:30 a.m. to 12:30 p.m. and a 5 or 6 hour afternoon charter starting at 1 p.m. The cost includes captain, mate, bottled water, ice and all fishing and snorkeling equipment. Food, soft drinks and beer are not included, but with advance notice can be put on board at an additional charge. Chubasco III is the best equipped charter sportfishing yacht available in Nassau and Paradise Island. Our fishing equipment is all top quality Shakespeare Ugly Stiks and Penn International II graphite rods and two speed Avet reels and consist of the following two 12lb., two 20lb., two 30 lb., two 50 lb. and various Spinning Rods and Reels. Electronics consist of a Garmin Cartographic GPS, Hummingbird Depth & Fish Finder, a ICOM VHF Radio and for your listening pleasure XM Satellite Radio. is one of our latest additions, it is an air-conditioned 38′ Hatteras Express. With a Marlin Tower, large fishing cockpit and a comfortable air-conditioned interior, Chubasco VI can comfortably accommodate up to 6 persons for fishing, sightseeing and snorkeling. It is $675.00 for a half-day charter (4 hours) and $1350.00 for a full day charter (8 hours). All prices quoted are for the boat for a private charter exclusively for your party and not per person. Prices are based on a maximum of 6 persons. Our half-day charters are 8 a.m. to 12 noon and 1 p.m. to 5 p.m.; on full day charters our departure times are flexible. We also offer a 5 hour morning charter starting at 7:30 a.m. to 12:30 p.m. and a 5 or 6 hour afternoon charter starting at 1 p.m. The cost includes captain, mate, bottled water, ice and all fishing and snorkeling equipment. Food, soft drinks and beer are not included, but with advance notice can be put on board at an additional charge.